Show your Team Spirit while entertaining guests with this College Football Outdoor Patio BBQ Grill Cover with the South Florida University Logo. 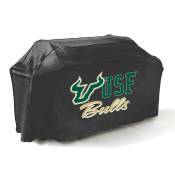 You can protect your BBQ grill from dirt, and other weather elements while supporting your favorite team. Your outdoor patio grill requires protection throughout the year to help extend the life of your grill. Protection from the rain, snow or sleet are a must to keep your exterior of your grill dry, clean and ready for use.